The award alternates among art song composers, singers, and collaborative pianists. It serves to raise public consciousness of art song and to honor those who have devoted their creative lives to this enriching form of music. 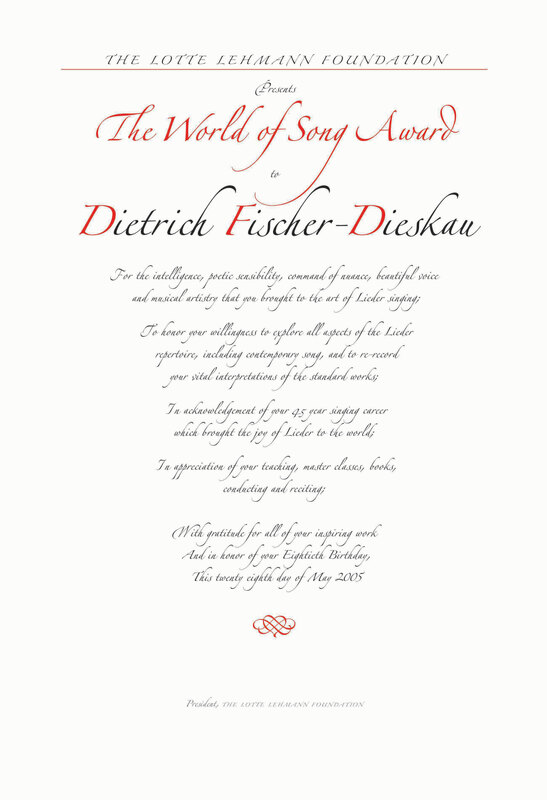 The Lotte Lehmann Foundation presented the “World of Song Award,” consisting of a beautifully framed document designed by noted calligrapher Denis Lund, to a deserving art song performer or composer. When the Foundation went into hiatus, the award was discontinued. Now in 2013 the Lotte Lehmann League renews the award. It has been offered to Kammersängerin Christa Ludwig and accepted. It is now finished, and you can view a copy of it here. 2001 Dalton Baldwin Dalton Baldwin has accompanied the greatest art song performers of our time. His legendary years as Gérard Souzay’s pianist are well documented in recordings. Mr. Baldwin has also accompanied Elly Ameling, Jessye Norman, and the late Arleen Auger. Presently teaching at Westminster Choir College in Princeton, New Jersey, Mr. Baldwin finds time to travel around the world teaching art song master classes. He knew Lehmann personally and visited Lehmann’s home in Santa Barbara, California, with Souzay. On 19 December 2001 Mr. Baldwin celebrated his 70th birthday with a grand, musical party in New York City. The Lotte Lehmann Foundation presented him with its first annual World of Song Award. In celebration of his one hundredth birthday, the Lotte Lehmann Foundation awarded Hugues Cuénod the World of Song Award for 2002. Hugues Cuénod, tenor, is a singer who has sung everything, from Machaut to Stravinsky. An outstanding sight-reader, with a flair for the unusual, Cuénod has left a discographic heritage of the first order. Especially noted for his recordings of mélodie, Bach and Elisabethan song, his performing career continued until his mid-90s. He was born in 1902 and holds the record as the oldest person to make a debut at the Metropolitan Opera, singing the Emperor there in Turandot in 1987. In an interview in 1997, 95-year-old Swiss Cuénod talked to pianist Graham Johnson, recalling prewar Vienna and Paris, where he frequented aristocratic salons and worked with Nadia Boulanger. After the war, the new early-music boom relied heavily on his light, unmannered, natural sound, and Cuénod made several pioneering LPs — his 1950 recording of Couperin’s Lamentations prompted Stravinsky to ask him to sing in the premiere of The Rake’s Progress. Opera has been a constant thread, but at the heart of Cuénod’s repertoire is French song — he knew and worked with Honegger, Auric, Roussel, Poulenc, and others. Though he didn’t know Mme. Lehmann personally, he has written letters to the Foundation recalling specific performances that he enjoyed both in Vienna and Paris in the 1930s. In interviews with Gary Hickling, he also spoke of his hearing Lehmann both in opera and Lieder. Mike Richter writes the following: Anyone familiar with French opera must know of Hugues Cuénod, the great, Swiss-born leggiero tenor of the Opéra. Like his successor, Michel Sächal (25 years younger), Cuenod’s career extended far beyond the comprimario rôles of opera. He was also noted in concert, singing exquisitely in English, German and Italian as well as in his native French. His style is unquestionably French and his voice has the characteristic softness and fluidity of that land’s most lyric instruments….Despite the delicacy of Cuénod’s production, he was easily heard even in the most demanding venues and was a mainstay at Glyndebourne in over 470 performances. Of course, he did have the advantage of sixty-year career to amass such a total. 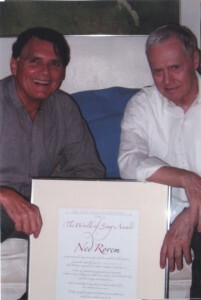 In 2003, on his 80th birthday, the Award was presented to the Pulitzer Prize-winning American composer, author and collaborative pianist, Ned Rorem. The man who Time Magazine called “the world’s best composer of art songs,” possesses a special genius for prosody and melodic beauty. IN APPRECIATION of your achievement as producer and pianist of the “Complete Songs of Schubert” and the “Complete Songs of Schumann” recordings and to applaud your unique scholarly and detailed liner notes for all your recordings. After arriving in Britain from his native Rhodesia (now Zimbabwe), Graham Johnson studied at London’s Royal Academy of Music and subsequently with the late Geoffrey Parsons. In 1972 he was official accompanist at Peter Pears’ first masterclasses at The Maltings, Snape, and thereafter worked regularly with the great tenor. In 1975 he was invited by Walter Legge to accompany Elizabeth Schwarzkopf. In 1976 he formed The Songmakers’ Almanac to further the cause of neglected areas of piano-accompanied vocal music and to place the staple repertoire of song in new and challenging contexts. This endeavour was much supported by the late Gerald Moore, whose guiding influence in Johnson’s career was of crucial importance. Apart from devising and accompanying over one hundred and fifty Songmakers’ recitals, Graham Johnson has presented a number of summer recital cycles for London’s South Bank and Wigmore Hall, as well as a seven-part cycle of Goethe settings for the Alte Oper, Frankfurt. He has written and presented programmes for both BBC Radio and Television on the songs of Schubert, Poulenc, Liszt, and Shostakovich. He is Professor of Accompaniment at London’s Guildhall School of Music, and a Fellow of that School as well as of the Royal Academy of Music. He has given masterclasses as far afield as Finland, New Zealand, and the Music Academy of the West in Santa Barbara, California. Graham’s project to record the entire Schubert Lieder for Hyperion continues to attract critical acclaim, including the ‘Gramophone’ Solo Vocal Award in both 1989 (for his disc with Dame Janet Baker) and 1996 (for Die schöne Müllerin with Ian Bostridge). He has also recorded the entire Lieder of Schumann. The first disc in this series, with Christine Schäfer, won the 1997 ‘Gramophone’ Solo Vocal Award. Graham Johnson was awarded an OBE in the 1994 Queen’s Birthday Honours list. And in honor of your Eightieth Birthday, This twenty eighth day of May 2005. In his thank you he wrote: “What a wonderful surprise! Thank you so much for a joy to my 80th birthday. This is a great honor!! I often think of the wonderful Lotte Lehmann and therefore am especially greatful… Yours ever, [signed] Dietrich Fischer-Dieskau.” The note card on which he wrote this reply includes one of his own landscape drawings “signed” in the lower right hand corner. You can see a copy of the note here. In acknowledging the 2006 prize, Pulitzer Prize-winning American composer Dominick Argento wrote: “I am highly honored and grateful to have been selected as the 2006 recipient of the Lotte Lehmann Foundation’s World of Song Award. To have one’s name even distantly linked with Lotte Lehmann is a great satisfaction in itself. To realize that the selection was made by one’s most esteemed colleagues greatly increases that satisfaction.” Click here to view the award. John Wustman, the distinguished American collaborative pianist and educator, was chosen by the Board of Directors of the Lotte Lehmann Foundation as recipient of its annual 2007 World of Song Award. Click here to view the award. Upon finding that he was to receive the award, Wustman himself said: “With my heart full of love and gratitude I accept the World of Song award from the Lotte Lehmann Foundation. We go along very happily and content and then such a surprise as to find that I am receiving this great honor. There are good things in this life.” The citation (see illustration at left) consists of a beautifully framed document designed by noted calligrapher Denis Lund. 2008 Janet Baker Janet Baker, the distinguished English mezzo-soprano was selected by the Board of Directors of the Lotte Lehmann Foundation as the seventh recipient of its annual World of Song Award. Click here to view the award. 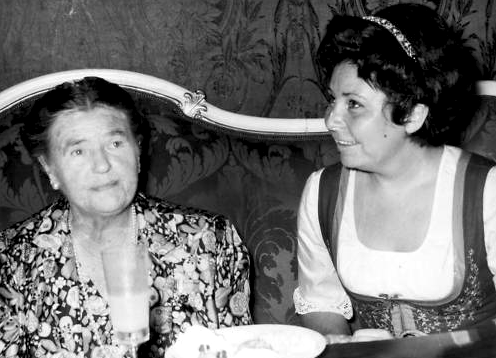 Under the auspices of the Lotte Lehmann League, the World of Song Award was presented to Kammersängerin Christa Ludwig. You can view the original document here. This award celebrates your 85th year and your continuing commitment to music.